We feel that the wearing of a smart and presentable uniform plays an important part in getting students to take pride in their appearance, their work and their school. It creates a strong identity which we should all be proud of. We will make you aware in the event of the uniform expectations not being met and appreciate your efforts in resolving any such issues. Students who are not wearing the correct uniform may be sent home to rectify this. You will always be notified if this should be the case. All students are required to wear the academy uniform. It is designed to be smart, serviceable and inexpensive. It creates a sense of belonging, and reduces arguments at home. The wearing of uniform is strictly enforced. However, a few students attempt to bend the rules, and the vast majority of students who do abide by the regulations see this as unfair. We look to our parents to support us by ensuring that their child leaves home wearing the correct uniform. Please click here to access the PE Kit letter. Black school trousers should be in a traditional 'loose fitting' trouser style and not tight fitting. Denim/Denim Style, stretchy tight materials or 'skinny' type trousers are not acceptable. Trouser legs should have the capability of covering a school shoe. Socks should be plain black. School shoes must be plain black, made of a conventional material which can be polished, without coloured logos, tags and soles. Trainer style shoes are not permitted. All items of jewellery present a potential safety hazard and must be removed for PE lessons. The Academy, however, takes no responsibility for these items. As a matter of health and safety, long hair must be tied back and PE footwear laced up fully to avoid accidents. The school does not allow jewellery to be worn (ie rings and necklaces). It will, however, accept the wearing of one small stud in each ear but will not accept responsibility for it when it must be removed for sport. Facial piercings are not acceptable on grounds of health and safety. Students who break the rule and wear jewellery will be told to remove it. Jewellery may well be confiscated for student/parental collection. Extreme hairstyles are not permitted this includes but is not limited to vivid colours, very short shaved hair, tramlines and patterns. Make up should not be seen. False nails or excessively long natural nails and false eyelashes are not permitted at any time and are considered a health and safety issue. Baseball caps are not permitted to be worn in school or on the school premises. Sensible headwear may be worn in inclement weather but must not be worn inside the buildings. Headwear worn for religious reasons must be plain black. Students will need a warm winter coat. This must be a plain dark colour i.e dark blue or black. Please note that hoody type jackets or cardigans are not permitted in school. They will need a sturdy school bag in which to carry their books, stationery equipment, and their PE kit. 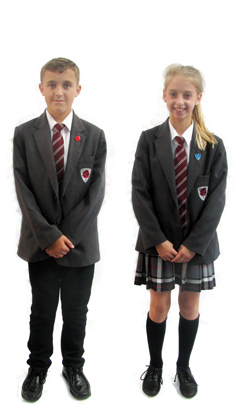 School uniform can be bought directly from Just Schoolwear in Bulwell or Arnold. Click here to access their website.